Ye haw, we're goin' to the Klondike! In August 1896, the discovery of gold in the Klondike district of the Yukon Territory started the biggest gold rush in North America. In the spring of 1897, thousands of men and women from Canada and the United States headed north to strike it rich. They climbed mountains and crossed some of the wildest country in Canada in pursuit of their dreams of gold. They also came by boat up the Yukon. 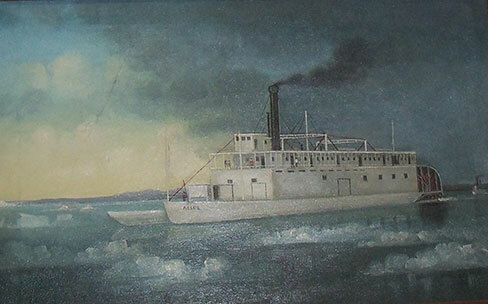 The Stern wheeler Alice, owned by the Alaska Commercial Company began operating on the Yukon in 1895 and continued until 1914. She carried supplies to the company's trading posts on the Yukon River, taking freight and fur traders, miners and prospectors up and down the river. She was the first steamboat to dock at Dawson after her 1700 mile trip up the Yukon and was the first vessel to carry gold out of Dawson during the Alaska Gold Rush. The miners and prospectors, anxious to get back to the "outside world" with their treasure I'm sure were very glad to see the Alice in 1897! They carried their gold in boxes, blankets, cases, jam jars and pockets eager for the journey down the Yukon to St. Michael, Alaska where they would board the Portland, bound for Seattle or the Excelsior bound for San Francisco, the city who had "been there and done that" years earlier but never had the city seen a whole boatload of miners disembark at one time! What a wild bash that must have been! This Oil on Canvas of the Alice is a wonderful Folk Art Painting that depicts the Alice on the Yukon, probably in the May/June time period when the ice was breaking up and river was once again navigable. 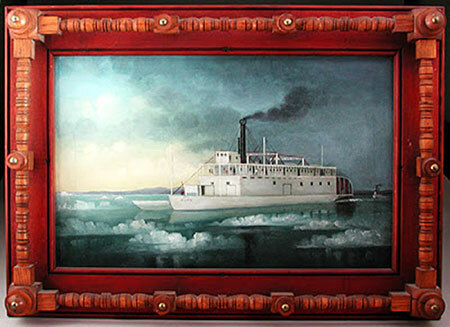 Being of shallow draft and being a sternwheeler she was able to operate on the Yukon more efficiently than the sidewheelers. It was said that she could "turn on a dime and give 9 cents change"! This painting was obviously painted by a folk artist of some considerable talent who, without a doubt, had first hand experience of life on the river and the vessels that plied it. It depicts a part of our history that "movies are made of". It talks to all who will take the time to listen of a time when life was lived to the limits . . . a realization of the quest for the ultimate great adventure and GOLD! This painting has it all. While folky, it is also extremely well done and has a very painterly quality about it. The frame is totally outrageous but compliments the work beautifully. You can tell my thermostat is high on this wonderful painting. Dimensions are 12-1/2"high x 18-1/4" long (sight) and 18-1/4" x 25-1/2" overall. The turned spindle Folk Art Frame gives the painting a depth of 4". It is in excellent condition.